Leaving your MacBook plugged in all the time—for example, in order to use it with an external monitor while its lid’s shut—can be bad for the battery’s longevity. The Battery Project’s FruitJuice (Mac App Store link) aims to help you keep your battery healthy by telling you when and for how long you’ll need to unplug each day. There’s no sophisticated voodoo behind this process. FruitJuice is simply tracking your previous week’s battery behavior, then recommending you stay unplugged for 20 percent of the time you typically use your laptop. You can configure a small but legible menubar icon to show you how many minutes of unplugged time remain. You can remain unplugged as long as you like, but FruitJuice will send you reasonably unobtrusive notifications when you’re free to plug in again. Clicking on the menubar icon reveals a long, clearly structured, and useful list of battery info and options, including your daily average time awake and on the battery, its capacity and number of charge cycles, and a graph of your recent power history. FruitJuice can also walk you through a once-every-30-days maintenance cycle, in which you charge to 100 percent, then run the battery down to 20 percent. 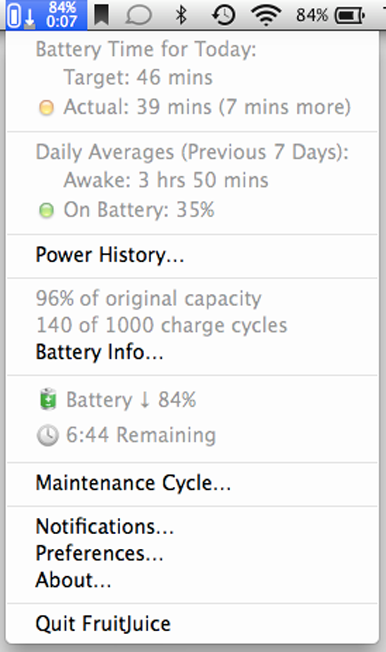 In the maintenance cycle I ran, FruitJuice didn’t tell me to plug in at 20 percent, though it initially said it would. Also—and this may have only been my perception, and nothing to do with the program—after installing FruitJuice, my battery life seemed notably and peculiarly shorter than it had been before. FruitJuice does its job well, and you’ll likely find it useful and worthwhile. I especially liked its clear, helpful online FAQs. But at $10, it seems a little costly, especially when free apps like Battery Health give you much of the same info without the price tag.